What do patients say online about your practitioners, hospital, clinic or care facility? 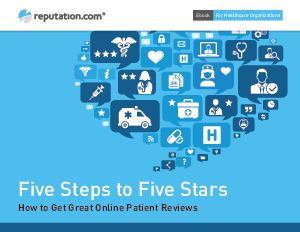 How closely do their reviews reflect the standard of care you provide? 77% of online health seekers began their session at a search engine. Whether you ask for feedback or not, patients share their experience online. Those patient reviews play an increasingly critical role in the reputation and financial success of your healthcare organization. As a marketing professional, one of the single most important things you can do for your organization’s reputation is develop an online review generation and monitoring program.